Ok, so the typical British weather has shown it's true colours this weekend, and has literally rained on our parade. Still, I'm not going to let the drizzle dampen my spirits, and I am not giving up on summer (even though I am sat here in a sodding jumper). Come rain or shine, we try to help you with all your boozy needs at Vinspire, and seeing as August is supposed to be a good'un - don't hold me to that - frozen drinks are where it's at. Laura treated us to an ice cream float with chocolate beer and raspberry liqueur on Friday (SO dreamy), Tim mentioned a Sipsmith and Jude's Gin Float in a previous post, and Jo's featured THE BEST iced cocktails on sticks; 'Poptails' from Lickalix. We've probably all had an alcoholic slushie of some sort in our time, be it a regular slush puppie spiked with vodka (blue raspberry all the way), or a tequila heavy frozen margarita, even just a scoop of sorbet sploshed with a glug of your chosen spirit will do. But now, it's never been easier to get in on the frozen action; booze giants Diageo have launched two new products that just require a little forward thinking. 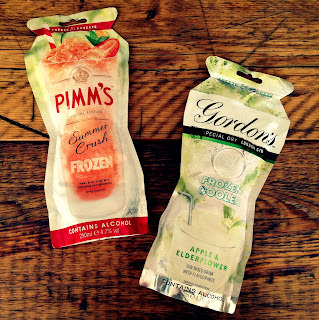 Pimm's Summer Crush and Gordon's Frozen Cooler are the "coolest" new way to enjoy our summertime staples. Both come in pouches that you simply have to whack in the freezer for eight hours, then squeeze the 'ready to serve' frozen drink into a glass and hey presto! A breeze, huh? 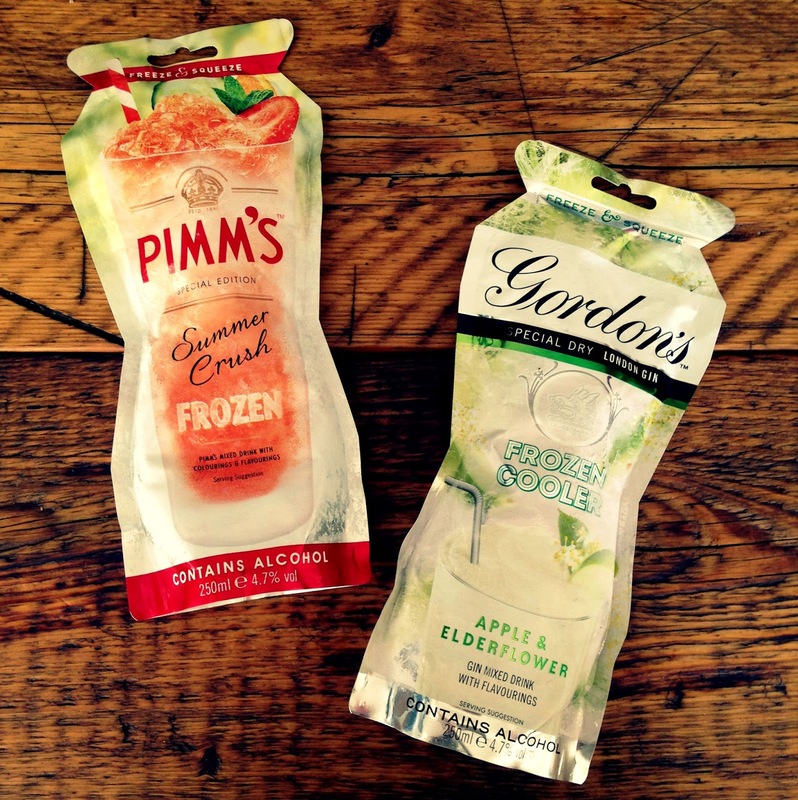 It's certainly no secret that Pimm's and gin are favourites with us Brits - it's always on offer in the supermarkets at this time of year - so this is a clever move, and luckily, a pouch of each arrived at my door last week! I unearthed the big kid in me, managed to find a window of sunshine between the rain, and tested these sassy slushies out for you.. Regular readers may well be aware of my cautiousness when it comes to Pimm's; I'm really not sure that I've ever truly enjoyed a glass of it. But, not being one to give up hope, I keep persisting, and if you look back to last month, I quite liked the new Pimm's Cider Cup. This, however, is a different kettle of fish (in a very good way!). 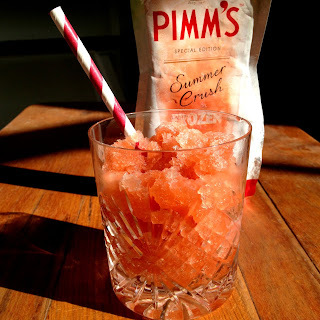 Wimbledon may be over for another year, but Pimm's Summer Crush combines the frozen taste of the nation's favourite with hints of strawberry and cucumber. As I always do with Pimm's, I expected to get a massive sugary hit upon my first sip, but nope, not with this one! The cucumber flavour is quite prominent, making it super fresh, and it actually kind of tastes like those old school watermelon Jolly Rancher sweets. The frozen nature of it balances the sweetness too, and both me and The Chap decided that we could easily drink this all day long without batting an eyelid. Needless to say, it didn't taste very alcoholic despite being 4.7% ABV, though I'm sure if you drank enough of them, they'd eventually catch you out! You can buy the 250ml pouch of Pimm's Summer Crush in all major retailers, but is currently in Asda for £1.98, or £2.00 in Tesco. Gordon's Frozen Cooler is gin - obviously - mixed with the delicate, fruity flavours of apple and elderflower. I was pretty excited by this, as these are the kinds of flavour combinations I bloomin' love. What I noticed first is that it tasted a lot stronger than the Pimm's Summer Crush, even though they're the same percentage (4.7% ABV). Elderflower can be quite overpowering in some drinks, but here, as Goldilocks would put it, it was "just right", meaning that even the floral-phobes amongst you would still be able to enjoy it. The snow white slush is a beauty in itself, and the iciness ensures that it's an instantly refreshing drink. That said, it's definitely sweeter than the Pimm's, which is the opposite of what I was expecting! It is incredibly moreish though. The 250ml pouch of Gordon's Frozen Cooler Apple & Elderflower is also £1.98 in Asda, or £2.00 in Tesco. Both of these frozen drinks were really tasty - I actually couldn't stop slurping - so I'd certainly consider buying them when the weather is being more well behaved! My only issue would be that 250ml makes one very large drink that's possibly a bit too big for one person, but splitting it between two doesn't seem quite enough. I'm not sure which it's aimed at...? 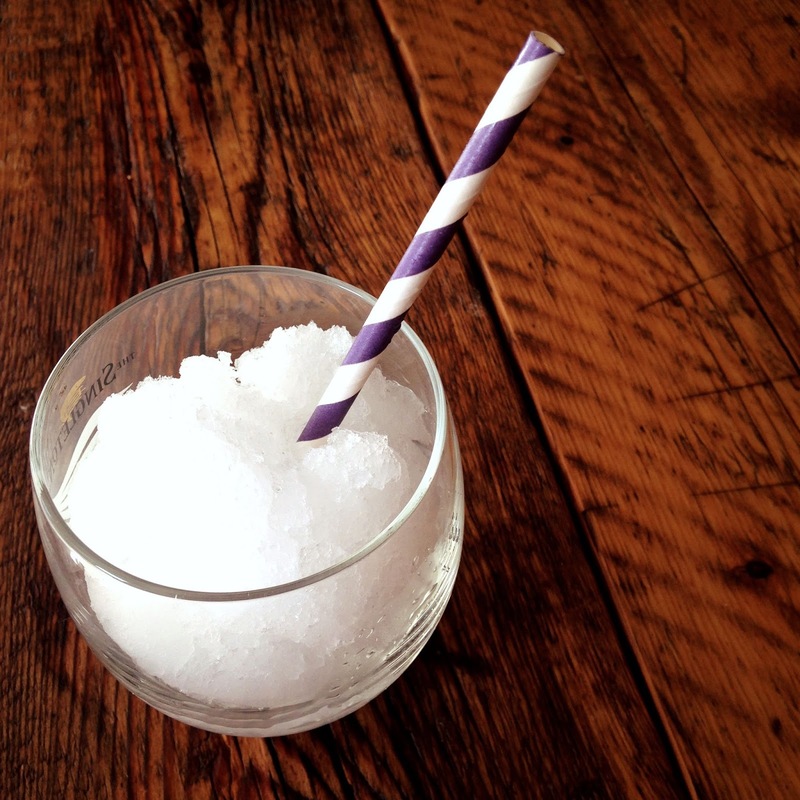 Still, a ready made summery drink that doubles up as a frozen granita dessert is always going to be a winner. Give them a go!